Improve your fighting prowess with new cards for enhancing your combat lifestyle. 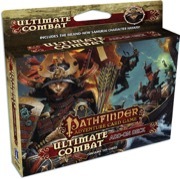 Chock full of enough armors and weapons for any war you might wage, the Pathfinder Adventure Card Game: Ultimate Combat Add-On Deck can be used with any Pathfinder Adventure Card Game character or Adventure Path. Or you can play with the brand-new character included in this 109-card box: Hayato, the iconic samurai. Get ready for action with the Ultimate Combat Add-On Deck! You can also use it alongside any Pathfinder Society Adventure Card Guild organized play campaign! Speaking of organized play, check out Pathfinder Society Adventure Card Guild #4-4—Relic in the Wastes—the latest scenario for Season of Factions’ Favor. Be sure to take a look at all the great Pathfinder Adventure Card Game products available here on paizo.com!